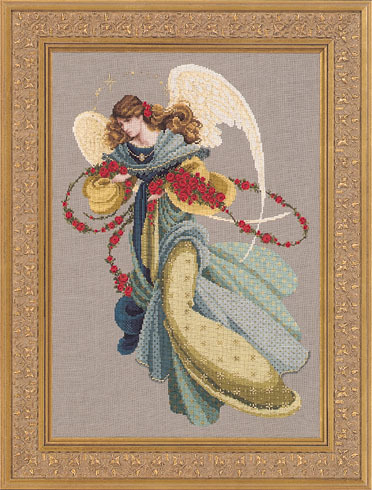 "Angelica" is an angel embellished with rich tapestry brocade (celery, deep blues, subtle oyster blues and burnished golds)... her flowing hair encircles her face and she is holding a garland of deep red roses that swirl around her. Her romantic image was inspired by pre-Raphaelite paintings which I saw on exhibit in Washington DC this spring (exhibit is still there). I have attempted to capture a glimpse of the grace and spirit these visions evoke. She could be stitched without wings and still be as lovely. She has clusters of robin egg blue beads that look like lace.